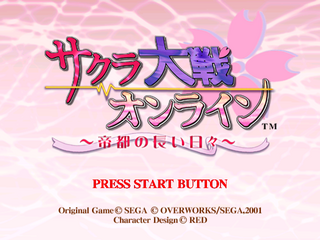 Sakura Taisen Online (サクラ大戦オンライン) is Sega Dreamcast game based on the Sakura Taisen franchise, and was released in 2001. It is effectively a set of Sakura Taisen-themed table top games and minigames which can be played online with other players. Two slightly different versions were released - one for the Japanese cast of characters (Teito no Yuugana Hibi (帝都の長い日); Sakura Taisen, Sakura Taisen 2) and one for the French (Paris no Nagai Hibi (巴里の優雅な日々); Sakura Taisen 3, Sakura Taisen 4). The contents of the two variations are the largely the same. Limited edition packages were bundled with Dreamcast Keyboard. Main article: Sakura Taisen Online/Magazine articles.